The cost of changing the name of politically incorrect J.E.B. 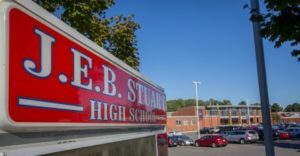 Stuart High School in Fairfax County Virginia will be passed on to the county’s taxpayers. The Fairfax County School Board voted on Oct. 26 to change the name to Justice High School. The school, located in Falls Church, was named after the Confederate general when it opened in 1958. The school currently is comprised of 75 percent minority students from 80 different countries, many of them from poor families. The cost of the name change, put at roughly $1 million, also does not include $200,000 in new spirit wear for the students of what is to be Justice High School. In 2016 the school was polled, and 90 percent were found to either like the name J.E.B. Stuart or found no compelling need to change the name. The idea of naming the school after the concept of societal “Justice” was not included in the list of possible names for the school considered by the community when it voted on Sept. 16. It was part of the proposed name “Justice Thurgood Marshall,” which lost to “Stuart High School” in total first place votes by a 2 to 1 margin. “It should also be mentioned that it was the School Board itself that insisted ‘Stuart High School’ be included in the Sept. 16 community vote in order to minimize costs and help heal divisions,” the Fairfax Free Citizen’s School Patrol wrote. “One down and 30 more politically incorrect school names to go in Fairfax County at a cost of up to $20 million, courtesy of Democrats who want to culturally cleanse America of history (sweeping out the good with the bad),” the School Patrol wrote.